[pc] Slightly Mad Studios: New DLC Each Month! Slightly Mad Studios has confirmed that players of its upcoming crowdfunded racing sim Project CARS will receive a series of free DLC vehicles in the months following the sim's release as a thank you to its racers for being patient while anticipating the launch. 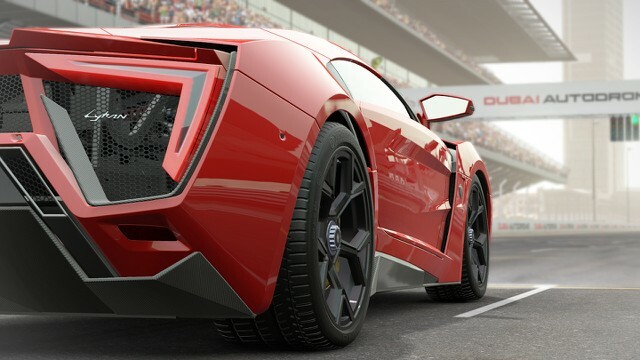 The first free car in the DLC is one of the most exclusive and expensive cars (3.4 million) ever made – the W Motors Lykan Hypersport. The Lykan is the first supercar to be produced in the Middle East and will be featured in the upcoming Furious 7 movie. The Lykan Hypersport is a limited production sports car by Lebanese based company W Motors that was founded in 2012. Only seven cars are build. The Lykan HyperSport is powered by a Porsche twin turbo flat-six 3.7-litre engine producing 740 bhp. The car has a top speed of 385 km/h (245mph) and accelerates from 0 to 100 km/h (0 to 62 mph) in 2.8 seconds. The Lykan Hypersport from W Motors has not only impressive power, but also a style all its own with stunning futuristic-type features and technology, such as a 3-D holographic mid-air dash.